Life With 4 Boys: Why Do You Make Me Resemble Medusa? Why Do You Make Me Resemble Medusa? This is your mommy speaking. Why do you feel the need to turn me into Medusa from time to time? A screaming banshee that instantly turns those who look at her to stone. Only, you don't turn to stone. No, on days that you turn me into a raging snake headed being, you do not even register that I am speaking to you. Did mommy just tell us to stop fighting? Nope, just keep on arguing. Did mommy tell us to clean our room? Nope, she obviously said to go in there and throw every toy off the shelf. Why boys? Why do I have to turn into a crazy chic from Greek mythology before you will listen? I don't want to ground you. I have delirious visions of fun family picnics at the local park, but every time I start to think about planning a trip out of the house, you seem to remind me that it would be a huge mistake. If you do not like each other, please do us all a favor and go do something alone. Look out the window. We have a huge fenced in yard, you have bikes, you have a big pool. Go, play, giggle. Nope. Instead, you stay in the living room and fight with each other. On days like this, it is like a horror movie I can't escape from. Tomorrow will be better. 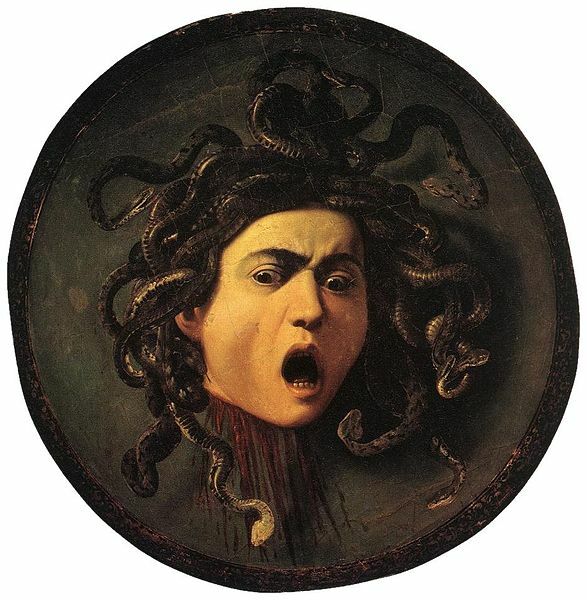 You will wake up and again be good obedient boys, but on days like this, mommy is Medusa. Your snake headed, crazy haired mom. Anyone else having a little trouble this holiday weekend? I think my 3 boys are tired of hearing me say: 'just walk away!'. I agree - if you don't like what your brother is doing/saying etc, walk away and find something else to do! I can relate, totally! Hilarious ... I have two boys who are 4 & 6 .... love this post! sometimes it is a 3 ring circus- and I feel like a lion tamer. All I lack is a whip and chair!